LAGO AGRIO, Ecuador, February 14, 2011 (ENS) – A judge in Lago Agrio today ruled that Chevron Corporation is responsible for oil drilling pollution in a section of Ecuador’s northern rainforest the size of Rhode Island, and he ordered the oil company to pay $8.6 billion in damages and cleanup costs. Chevron inherited the suit when it bought Texaco in 2001, and has denied the allegations of environmental damage. Judge Nicolas Zambrano issued the 187-page decision from Sucumbios Provincial Court, ruling in favor of indigenous residents of the Ecuadorian Amazon who have spent the last 18 years seeking damages for oil pollution. 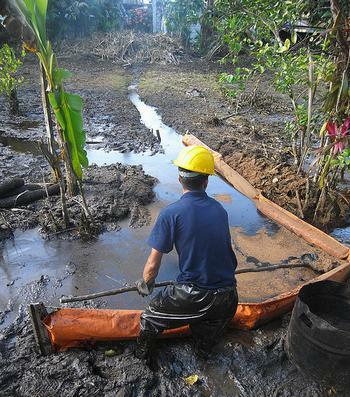 Judge Zambrano gave Chevron 15 days to apologize publicly for the contamination or face doubling of the damages figure. Texaco Petroleum Company, now a Chevron subsidiary, from 1964 to 1990 operated an oil concession in an area of Ecuador, reaping billions of dollars in profits before leaving Ecuador in 1992. The plaintiffs sued for damages, claiming their rivers are contaminated, crops no longer grow, and new illnesses and cancers have been introduced. The environmental lawsuit charges Chevron’s Texaco Petroleum Corporation with deliberately discharging more than 16 billion gallons of chemical-laced “formation water” into the streams and rivers of the Amazon over a 26-year period. The case was moved from U.S. federal court at Chevron’s request after Chevron filed sworn affidavits praising Ecuador’s court system. The plaintiffs submitted the first part of their final statement on January 18, finding “irrefutable evidence of contamination” at each of Chevron’s 45 well and production sites inspected by the parties during the trial. The chemicals found include barium, benzene, cadmium, chromium, copper, etheylbenzene, polycyclic aromatic hydrocarbons, vanadium, xylene, and zinc, all of which are toxic and some of which are carcinogens. The plaintiff’s statement concluded that the sampling results and other evidence provided by Chevron prove the claims of the plaintiffs. The plaintiffs, originally demanded $27 billion in the lawsuit. The lawsuit had 47 named plaintiffs but it sought damages on behalf of 30,000 people for environmental contamination and illness. 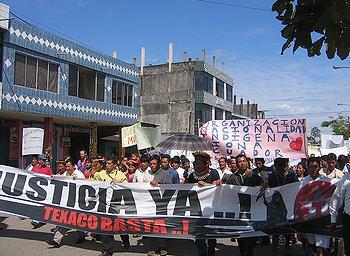 “As a general matter, the plaintiffs provided the court with a great quantum of scientific and documentary evidence that Chevron deliberately and in violation of all industry norms discharged billions of gallons of toxic waste into the rainforest and into the water supply relied on by thousands of Ecuadorian citizens,” Fajardo said. Through the lawsuit, filed in U.S. District Court of the Southern District of New York, Chevron seeks a court declaration that any judgment against Chevron in the Ecuador lawsuit is the result of fraud and therefore unenforceable. 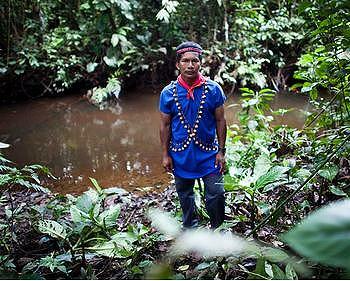 Chevron is also seeking damages associated with the cost of defending the Ecuador litigation. “The Lago Agrio plaintiffs’ lawyers’ aim has been to extort a multi-billion dollar payment from Chevron through fabricated evidence and a campaign to incite public outrage. Chevron has no intention of giving these plaintiffs’ lawyers the payday they seek. Rather, we intend to see the RICO defendants held accountable for their misconduct,” said R. Hewitt Pate, Chevron vice president and general counsel. “It is sad to see American citizens organizing a shakedown of a U.S. company while pretending to be helping Ecuadorians and the environment,” said Pate. Earlier this month, Fajardo released copies of legal motions signed by Chevron’s lawyers in Ecuador threatening Judge Zambrano with criminal sanctions and prison if he failed to grant their motions asking for a dismissal of the case. The threats were outlined in motions signed by Chevron lawyers Enrique Carbajal and Alberto Racines and submitted to the court. Headquartered in San Ramon, California, Chevron is the second-largest oil company in the United States. The company reported earnings of $19.14 billion in 2010.